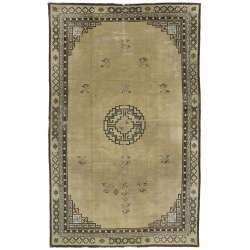 Antique Chinese rugs collections contain genuine Oriental rugs handmade with wool, silk or other natural fiber presenting a variety of knot densities. Wool quality is determined by fiber length, luster and springiness of the fiber. Design intricacy of antique Chinese rugs for sale refers to degrees of their design details, in addition to how many different hues are used to execute a stunning variety of patterns. Extremely complex designs decorating antique Chinese rugs mean the craftsman was an expert rug weaver who spent many hours laboring over a classic piece of timeless art. Rich in folklore, culture and history, antique Chinese rugs reflect religious and philosophical elements incorporating images and designs symbolizing the fascinating land of China — lotus blossoms, dragons, nature scenes, clouds, birds and assorted ornamental objects. Our antique Chinese rug collection online offers gorgeously colored rugs exhibiting bold, energetic palettes brilliant with jewel-rich accents of magenta, ruby red, violet, emerald and turquoise. Considered highly collectible rugs in today's market, antique Chinese rugs are sought after by high-end interior designers, architects, rug enthusiasts, museums, reputable businesses and other facilities wishing to present an impeccable impression to visitors. The Art Deco Movement influenced Chinese rug design in the 1920s and 1930s, bringing geometric images and bold, German Expressionistic type colors to all aspects of Chinese art. Appearing in France after World War I ended, Art Deco is immediately recognized by its almost glamorously eclectic spirit evoking Machine Age visuals and modern materials infused with a profound insight into the symmetrical chaos of mass production technology affecting world cultures at that time. One of the leading collectors of the finest vintage, antique and contemporary rugs in the country, Esmaili Rugs & Antiques caters to high-profile clients like Whoopi Goldberg, Mark Zuckerberg and Bill Gates. We have a knowledgeable team of antique rug experts who can be contacted Monday through Friday to provide in-depth, helpful answers to any questions you may have about our rugs. Esmaili Rugs & Antiques, "Where we collect the best of the past." Call us today at 214-651-7847 or contact us using our email form found here.